A coach full of English Defence League supporters was pelted with missiles after it broke down in east London. The coach was carrying 44 EDL members when it stopped in Mile End Road, Tower Hamlets. About 100 Asian teenagers then pelted it with bricks and stones, according to a BBC reporter at the scene. Police arrested all 44 EDL supporters, who were travelling from a protest in Aldgate earlier on Saturday. A double decker bus was used to evacuate them. Police said there had already been one altercation with local youths after the vehicle stopped in Whitechapel Road and some passengers got off the coach. They got back on board and the coach pulled away - but it later suffered a failure and ground to a halt. BBC reporter Paraic O' Brien, who was on the scene, said nearly 100 local teenagers then attacked it with missiles. He said the police were on the scene extremely quickly. 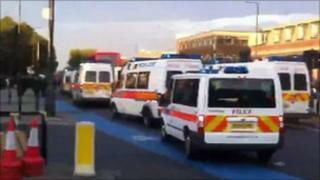 The reporter said within a short space of time there were a number of riot vans and 200 police officers in the vicinity. O'Brien said: "It was extremely tense and if that number of officers had not arrived it could have gone the other way and become a major incident." The police commandeered a London bus and moved the EDL supporters onto it before escorting the bus east. But a group of youths subsequently sat down in the middle of Mile End Road, blocking the bus and forcing it to stop. At this point a large number of Asian men began arriving from a nearby estate. The reporter said by then the situation had become very scary. The police charged the youths and scuffles broke out. Another group standing on a footbridge over the road threw bricks at the bus. Police managed to clear the road and the bus left the area. The EDL, which says it is protesting against Islamic extremism in the UK, had earlier held a protest in Aldgate after a planned march through east London was banned by the government. Shafiur Rahman had organised stewards for a rival demonstration earlier in the day. He said that allowing the bus through Tower Hamlets was a major security error that could have ended in disaster. Mr Rahman is a member of the Islamic Forum of Europe. A Met spokeswoman said: "A coach containing individuals believed to have participated in the EDL demonstration stopped in Whitechapel Road - some passengers got off and an altercation took place with some local youths who had gathered. "Shortly after, the coach broke down outside Stepney Green Underground Station, and a further disturbance took place. "Officers commandeered a double decker bus before transferring the passengers and escorting them off the borough." She added: "All those on the coach were arrested for public order offences and an investigation is ongoing to identify others outside the bus who participated in the disorder." Meanwhile the EDL's second in command, Kevin Carroll, has told the BBC its founder Stephen Lennon will hand himself in to police. Lennon, who was convicted in July of leading a street brawl with 100 football fans, breached bail conditions by taking part in the demonstration. On Saturday an EDL regional organiser had claimed Lennon had already been arrested - but this proved to be untrue. A total of 60 people - including the 44 involved in the bus incident - were arrested in connection with the EDL protest. Offences included assault on a police officer, common assault, drunk and disorderly behaviour and affray. Police estimated 1,000 EDL supporters and 1,500 counter-protesters had gathered.